Flexible, One Part, Fast Setting Cement Based Tile Adhesive. A fast setting cement based, thin or thick bed wall and floor tile adhesive. It is suitable for fixing ceramic, quarry, porcelain, vitrified, natural stone, travertine and mosaic tiles in internal locations. Conforms to EN 12004 Class C2F. Bond It RAPID-FLEX GREY is a flexible, fast setting, thick or thin bed adhesive for bonding ceramic, quarry, porcelain, vitrified, natural stone, travertine and mosaic tiles to walls and floors. 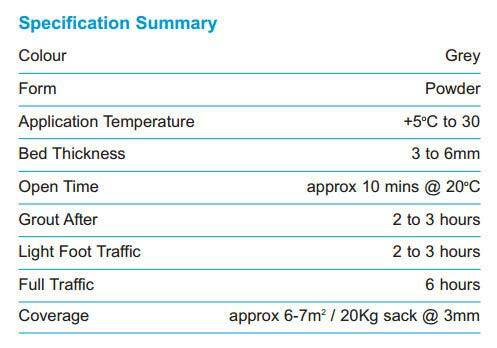 Because of the fast acting properties, tiles can be grouted and suitable for use in approximately 2 hours after fixing (at normal temperatures). 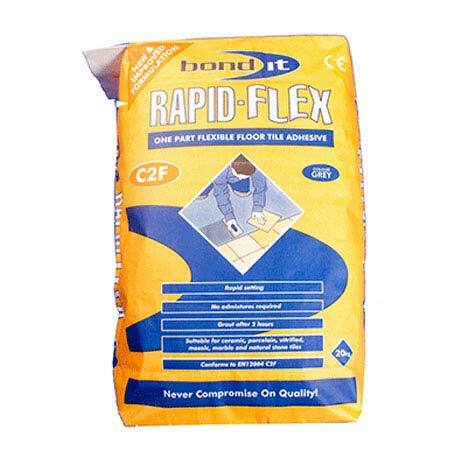 RAPID-FLEX GREY will bond to concrete, sand/cement screeds, building blocks and brickwork. It can be used to bond to wooden surfaces, glazed surfaces or used with underfloor heating. RAPID-FLEX GREY is suitable for interior use including locations which are subject to regular wetting eg. domestic showers and bathrooms. NOTE: This product is not suitable for use in areas subject to permanent water immersion. A separate flexible admixture is not required. Rapid setting, flexible and deformable. Can be grouted after 2 hours. Is suitable for ceramic, porcelain, vitrified, mosaic, marble and natural stone tiles. Conforms to EN12004 Class C2F. It dose what it is supposed to very well.